Got any Spotify music related issue like you can’t download or save any Spotify song offline or you manage to save it but you can’t play it because it’s in a weird format you have never seen before? There’s good news, you are reading the right article. This article is aimed at reviewing Spotify Music Converter for Mac software to find out the best ways to enjoy your Spotify music or songs without any issues. This would save you time and stress because you will learn how to download or save Spotify songs or playlist offline and convert Spotify Ogg Vorbis format to the popular music format you desire. Spotify Music Converter for Mac software is made by DRmare is a considered to be a smart Spotify music downloader which would help you download Spotify songs and playlists with your free Spotify account, yes, that’s right you don’t need a Spotify premium account and this software can also help you convert Spotify Ogg Vorbis music format to universal widely used song formats like MP3, WAV, AAC, FLAC, M4A, M4B. By default, all Spotify songs come with DRM Protection which prevents people from downloading and sharing the songs or playlist over the internet or offline. This was done to reduce the number illegal privacy or downloading of artists songs or playlists on Spotify. So, DRmare Spotify Music Converter Mac is used to remove DRM from Spotify songs. You can only download Spotify music when you have a premium account and that costs about $10 per month, that’s $120 every year but with Spotify Music Converter for Mac, you can download or save Spotify songs and Spotify playlists offline with a free Spotify account. All you need to do is download this software, open a free Spotify account then start enjoying free Spotify songs. All Spotify songs come in the original Ogg Vorbis music format which can only be played on the Spotify app. 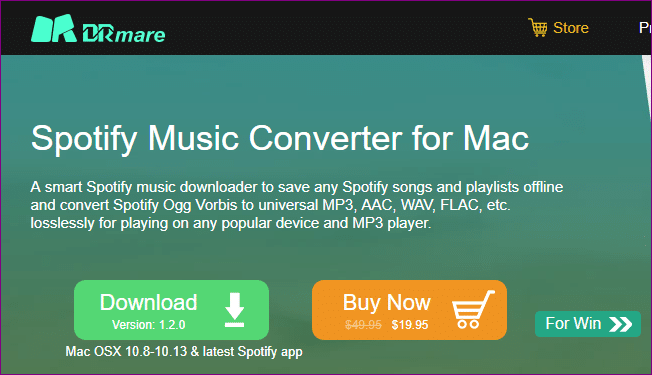 Using Spotify Music Converter for Mac, you can easily convert the original Spotify music format to popular formats like MP3, WAV, AAC, FLAC, M4A, M4B. 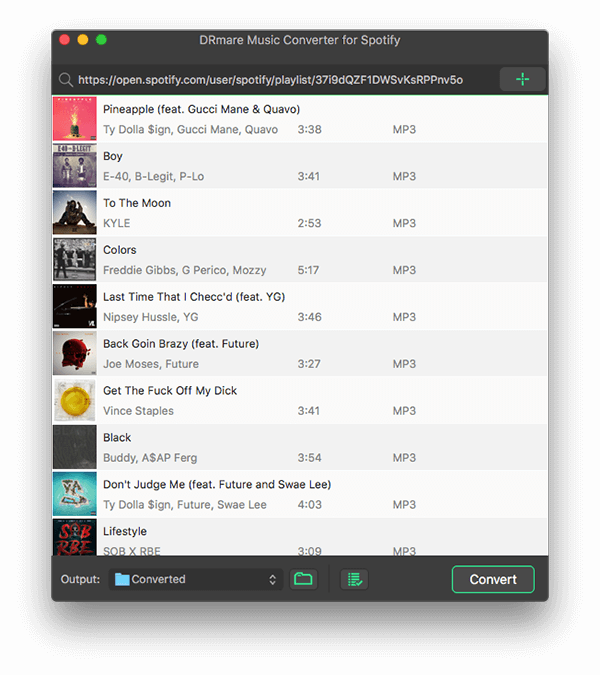 Spotify Music Converter for Mac provides you with the best song quality even after converting your favourite songs or playlists. They use the lossless quality technique which maintains audio quality above all else. 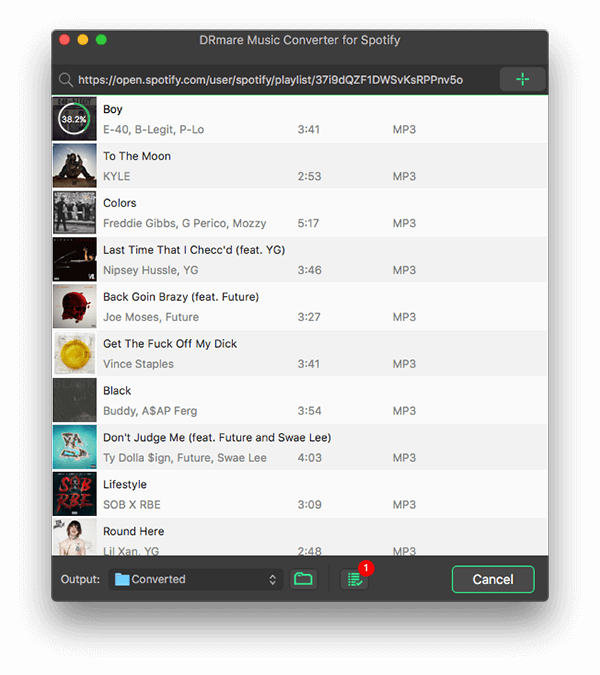 We are going to teach you how to use Spotify Music Converter for Mac effectively by showing you how to use this software to remove DRM Protection, save Spotify songs and convert Spotify songs to MP3 format. Step 1: Download DRmare Spotify Music Converter Mac trial software (4.6MB). Step 2: Download Spotify app on your Mac and register a free Spotify account (if you don’t have one already). After downloading the Spotify app and installing, you need to visit their website to register a free account with them. After that navigate to the Spotify song, album or playlist you want to download, save or convert using DRmare Spotify Music Converter. 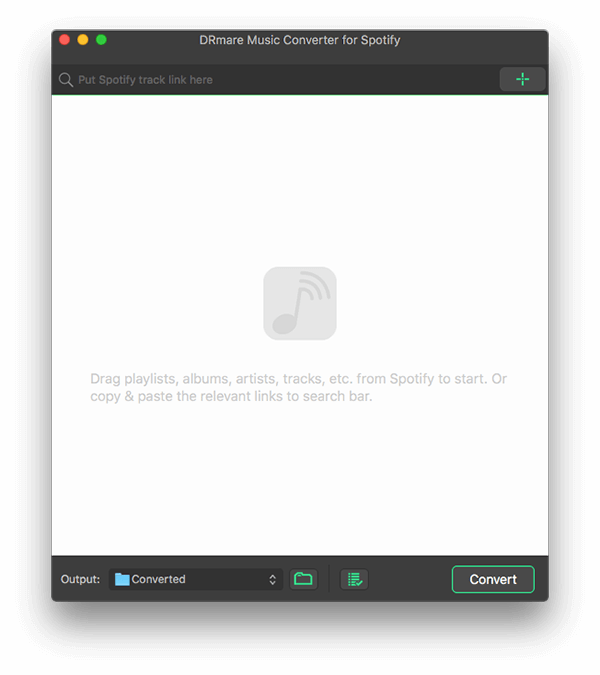 Step 3: Install and launch DRmare Spotify Music Converter Mac software. 1st method: Drag and Spotify songs from the Spotify app to DRmare Spotify Music Converter. 2nd method: In the Spotify app, navigate to the song or playlist you want to save, Right-Click and choose “Copy URL”, open DRmare Spotify Music Converter software and Paste the link in the search box. Now finally hit the + icon to add all the Spotify songs in the playlist. 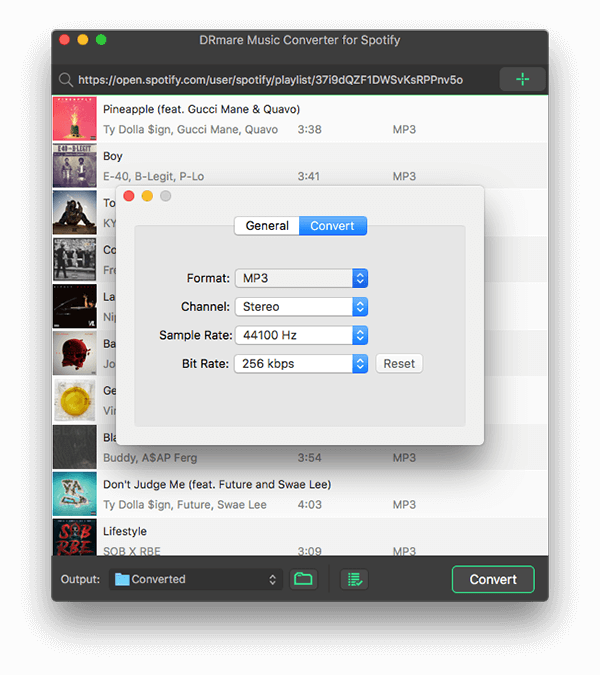 With DRmare Spotify Music Converter software, you can select the most popular music format like MP3 and set it as the output music format which means when you export Spotify songs or playlist, they would all be in MP3 formats or a format you choose. This is the last step and all you need to do is just click on the “CONVERT” button to start downloading Spotify songs, playlist, albums for free.